Don’t Make This Abs Mistake In the Gym! Sorry, but I just had to write about this today. I was in the gym for an hour today and must have seen a dozen people performing this exercise. You know, the side bends holding dumbbells. There are a couple of reasons why you want to avoid this exercise and two exercises that are much safer and more effective. The first reason you should avoid this exercise is safety. These side bends with weights put a lot of stress on your spine, especially if you twist your torso even slightly. The second reason to avoid this exercise is strictly cosmetic. Most people do this exercise to target the oblique muscles and they are not wrong in their attempt. However, I’m assuming you’re not really going for that “boxy,” Sponge Bob Square Pants type of look for your torso. Again, I’m totally guessing here! 😉 The side bends do target the obliques, but in a way that can actually build and grow muscle. “But wait, I’m trying to build muscle,” you say. You are but this is an area of your body where you want to build muscle DENSITY, not muscle SIZE! Big difference! By building muscle density with the obliques your core will appear tone, firm, and lean instead of big, bulky, and boxy. Does that make sense? Do your homework and find out the proper form for these exercises and incorporate them into your core training! Your spine will thank you! So You Want 6-Pack Abs??? 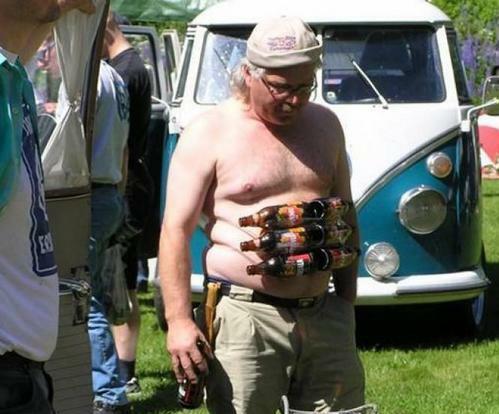 I truly hope this isn’t the 6-pack you’re hoping for! 😉 The desire for 6-pack abs is immense these days. Just take a look at any magazine stand, I guarantee at least 90% of the health/fitness magazines have a headline on the front cover stating its guarantee to get you 6-pack abs. Some of these articles are okay, but the majority of them are missing the boat completely. You see, when you flip to these articles in the magazines, most of them are showing you dozens of different ab exercises for you to perform thousands of reps. This couldn’t be further from the truth. Now, is direct ab work important in developing a nice flat, toned mid-section…YES! However, it places a DISTANT 3rd behind proper diet and High Intensity Interval Training. That’s right…..if you want a six-pack, DO NOT focus on performing 1000’s of crunches daily (will discuss later). That’s why people get so frustrated and give up when they don’t see any results after saying, “But I did hundreds and hundreds of crunches everyday, and didn’t see any change!” They are approaching it completely backwards! What you need to understand is that EVERYBODY, yes EVERYBODY already has abdominal muscles. It’s just that people have layers of fat covering up the muscle. Instead of working on the muscles, you must focus on peeling off the layers of fat so that the muscle definition can be actually seen, leading to the 6-pack abs you desire! 1) Eat a clean diet! Let’s break it down. First and foremost, abs are made in the kitchen! You can’t outwork a bad diet. So cut down on the carbs, dairy, sugar, and processed foods and start eating whole foods, mostly plants, and flat-out don’t eat so much! Next, research continues to show how much more effective High Intensity Interval Training is than long, slow, boring cardio in burning stomach fat. Instead of doing 45 minutes of steady-state cardio, perform 2o minutes of interval training. Pick your exercise (treadmill, spin bike, elliptical, row machine, jumping jacks, kettlebell swings, run in place…whatever you want), go as fast as you can for 45 seconds, then rest for 45 seconds. Repeat that for as long as you can working up to 20 minutes. Overall, you save time and burn more fat (even after you’ve completed the workout). Third, perform full body abdominal exercises. Do crunches work the abs…yes, but they put dangerous stress on your spine and promote poor posture. Instead, perform planks! In my opinion, they are the best thing you can do to strengthen your core! When I made this change in my workouts, I saw great results quickly. Now, I can’t even remember the last time I did a crunch! How do you perform them? Same concept, just with arms on a stability ball. You will be amazed at the burn you feel! So there you have it….the truth about 6-pack abs. Hopefully this was helpful! Summer is just around the corner, now is the perfect time to get started! Don’t Make This Mistake in 2011!!! “That’s the term for people who think that an hour of cardio will make up for the previous day’s dietary indiscretions. But nothing can be further from the truth. It’s the BIGGEST cardio mistake. For the next two months, millions of bloated men and women will be stepping on stairmasters, mounting elliptical machines, and parking their butts on bikes for hours while repenting their sinful Christmas time indulgences and other holiday feast transgressions. Unfortunately, they will do all this with little return for the investment of their time. Heck, even scientific research proves that they are wasting their time. First, from Australia, a study shows us that long, slow, boring cardio didn’t help one group of subjects lose fat, while another group was able to burn a lot of belly fat with interval training. And second, an American study showed that doing 300 hours of cardio in a year led to less than 6 pounds of fat loss in men and women. – The cardio confessional is a waste of time. 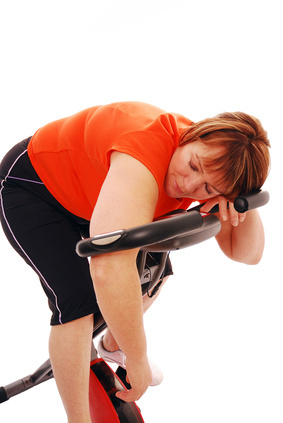 – A mindset that involves “exercise as punishment for overeating” is unhealthy and ineffective. 1) Run in place with high knees as fast as you can for 20 seconds. Start out performing that just 3 times (2 minutes total), three days per week. As you improve, just add more intervals. Maybe try to add 1 interval per week up to 10 or 12 total intervals. Research shows this type of training burns fat for up to 36 hours afterwards. How about that return on investment? Throw in some resistance and core training and you’re set! I wouldn’t consider myself a huge soccer fan, but I have been watching a bit of the World Cup these days. The one thing that I noticed is that there were no (zero, zip, zilch) overweight soccer players. Every single player was lean, fit, athletic, strong, and probably under 10% body fat. There were no big, bulky, “meathead” looking guys either. Just healthy athletes. It was amazing to see! The question is how and why are they like this??? I feel the answer is simple. Soccer is a “High Intensity Interval” sport. Meaning that the sport is played with low-level aerobic activity followed by short BURSTS of High Intensity sprints. This is the way our bodies were meant to be trained! Our ancestors trained the same way! The Hunters and Gatherers of the past walked, hiked, and roamed for food. Then, when it was time to hunt, there were short bursts of INTENSE activities. Our ancestors were lean, athletic, and strong as well. Notice, they did not jog at 70% of their Max Heart Rate for 45 minutes at a time (still better than nothing, but I will spare you the research that shows the BETTER results you can get in as short as 4 minutes with High Intensity Interval Training). Do your own experiment. The next time you’re in the gym, look on the cardio machines for people doing the long, slow, boring cardio. Ask yourself if these are the bodies you aspire to look like. I’m convinced that 3/4 of the people are not what you want! (then again, 5/4 of Americans are bad at fractions and 60% of all statistics are false! ha). Now look for the people that are training like athletes: jumping, sprinting, squatting, doing short/intense workouts….these are the people/bodies that you want to look like! Repeat 3 more times (4 total). You’re done in 4 minutes!!! Do this 3 times per week on alternate days (Ex. Mon, Wed, Fri). On your “Off” days, just keep moving by going for a 30 minute walk. Everybody’s MAX EFFORT will be different! That’s the beauty of it! Just do the best you can! I will be covering this in detail at the next workshop on Tuesday, July 6th at 5:45 PM. It’s called “FIT IN 15”. Look for the sign up sheets in the office! This one filled up pretty fast last time we did it in January. If you want to lose weight and change your life in 12 minutes per week…read on. They discovered that the “High Intensity Interval Training” method proved to be more effectual when it came to all aspects of fitness training, including muscle building, fat burning, maintaining skeletal tissue, and yielding a higher return of benefits than any other counterpart in the fitness industry. Other studies have shown that performing just 4 minutes of High Intensity Interval Training allows your body to burn fat for up to 36 hours afterward. It just begins the process. Does that sound similar to an adjustment? I think so! Imagine…4 minutes of work, and then your body is turned into a fat burning machine for up to 36 hours! Run in place (with high knees if possible) for 30 seconds AS FAST AS YOU CAN. Then, rest for 30 seconds. Repeat this 3 more times (4 total). You’re done in 4 minutes! Perform this every other day. Simple as that! Since I started training like this a few months back I have lost about 8 lbs and 2 inches in the waist….here’s the thing…..I wasn’t even trying to lose weight!!!! It’s science! It works! In the words of Nike…”Just Do It!” 12 minutes per week to change your life….the choice is yours!